Lohagarh Fort, Bharatpur: Lohagarh Fort in Bharatpur is one of the architecturally sound forts in Rajasthan. 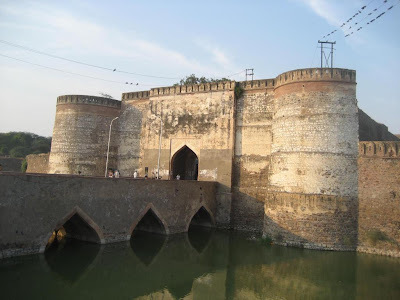 This fort, also known as the Iron Fort, was built by Maharaja Suraj Mal.The fort is well-known for its sturdy structure, which was able to withstand continuous attacks from the British army. There are three palaces in the fort, Mahal Khas, Kamra Mahal and Purana Mahal. Currently, Kamra Mahal functions as the State Archaeological Museum. Some of the other monuments in the premises of the fort include Kishori Mahal, Kothi Khas, Moti Mahal, Jawahar Burj and Fateh Burj.